MOVEMENT: You move a piece in one of three directions. Move it straight ahead, or forwards at a 45 degree angle to the direction the piece was pointing. After a move, leave the piece pointing in the direction you've moved it. This is the only way that pieces move from tile to tile. BORDERLAND CHANGE: When you move a piece across one or more borders, and set your piece down in a different borderland (a border crossing) then you replace one of the neutral tiles in this new borderland with a tile of your colour. POWER OF MOVEMENT: Count the tiles of your colour in the borderland and that number is the power of movement of the piece. If there are no tiles, the power of movement is one. You can move that particular piece any number of tiles between one and its power of movement. LONG MOVE: When you move your piece more than one tile (a long move), you cannot change direction in the middle of the move. You must move in a straight line (directly ahead, or ahead at 45 degrees). At the end of the move leave the piece pointing in the direction you have moved it. CONNECTION CHANGE: When you make a long move from one tile of your colour to another tile of your colour (a connection), and you are not jumping any pieces, you must change all the intervening tiles to your colour. If this connection is also a border crossing then you must choose either to gain tiles from the connection change or from the results of the border crossing: you cannot claim both benefits. CONNECTION JUMP: When you move from one tile of your colour to another tile of your colour, you are allowed to jump any intervening pieces. However when you make a connection jump, you do not make a connection change and so no intervening tiles are changed. BORDERLAND TRANSFORMATION: When you set your piece down having crossed a border, if there are no neutral tiles (whether occupied by a piece or not) left in the new borderland, then you change any tile within the borderland to your own colour. PINCER: When a piece has a power of movement such that it could reach a tile occupied by an opposition piece, and there are no intervening pieces, then it is said to be attacking that piece. You can make a pincer when two or more of your pieces are already attacking an opponent’s piece at the start of your turn. In the pincer you remove the opposing piece from the board, change the tile it was on to your colour, and move one of the attacking pieces onto the tile. 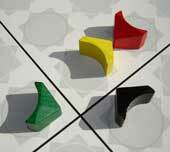 The pincer can be done even when the opponent’s piece is occupying a tile of their colour. MEETING: When you move a piece so that you have two of your pieces both occupying tiles of your colour and directly facing each other on adjacent tiles you have achieved a meeting. As a result of the meeting you change any tile anywhere on the board to your own colour. ONE MOVE - MANY ACTIONS: When you make a move involving any one of the six special actions, the move may also involve another at the same time (a pincer may also be a borderland change). You get the benefits of each action, except for moves which are both borderland crossings and connections where you have to choose between the tile benefit for the crossing and that of any connection change. REORIENT: You can use your turn in a different way and instead of moving one piece, you can reorient one piece. When you reorient a piece by 45 degrees, you must choose two of your own tiles and change them back to neutral. When you reorient by 90 degrees, you must choose four of your tiles to change back to neutral. You can only use a turn to reorient if you have one or more pieces you could move if you chose to: if none of your pieces can make a move from one tile to another you are out of the game.